I bought the Humble Bundle for the next two weeks and one of the games that came with it is The Bureau Xcom Declassified. 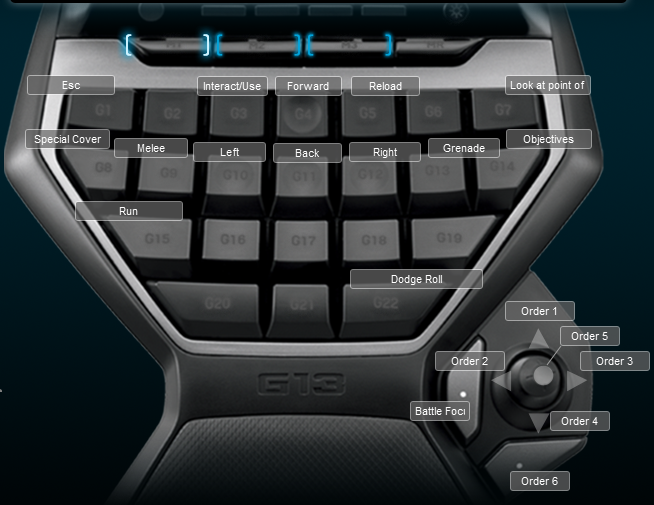 I made a Logitech G13 profile for it because I don’t like playing anything that is a shooting game with a game pad. The game’s controls included the ability to give orders to party members. I put all the crew orders on the joystick, but so far I haven’t used them. Below is a screen shot of the keyboard layout. I attached the go to and follow orders to my mouse’s 4th and 5th buttons respectively..